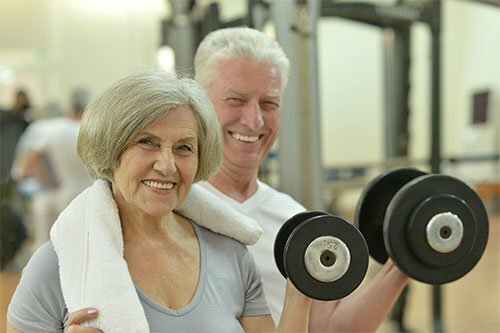 Strength training for seniors does some basic things: it preserves bone density and muscle strength and improves balance and flexibility, all which help to maintain daily living independence. Regardless of your level of fitness, age or gender, strength training benefits everyone. Osteoporosis in older adults is a major cause of frailty and can affect quality of life, especially after a fall resulting in a broken bone. For reasons not yet fully understood, but supported by several study results, strength training not only increases muscle strength and mass, but also strengthens bones and increases bone density. Weight or resistance training not only prevents further muscle mass depletion, but it actually improves the strength of the muscles by toning them up; it can even build back some muscle mass lost over the years through aging. Tone muscles make you look younger and feel better about yourself. With falling as a major source of injury and broken bones among seniors, it is important to do what you can to maintain or improve balance. Strength training helps build and tone the abdominal core and back muscles, thus giving your spine more support. By keeping your posture more upright, your weight more centered over your spine and you are less likely to lose your balance and fall. Supplement strength training with exercises that transfer weight back and forth, such as walking or using an elliptical trainer. Increasing the range-of-motion of a joint also help with balance. To improve flexibility, focus strength training efforts on exercises that work a joint through its full range. Yoga is an excellent exercise program for doing this. Dynamic stretching before strength training helps warm up and loosen joint muscles. Because muscle fibers tend to shorten during a workout, static stretching after exercising works to cool down and return the muscle fibers back to their normal length thus helping reduce the risk of injury and soreness. While dynamic stretching works the muscle back and forth through its range of motion, static stretching extends a muscle out to its maximum range and holds it in that position for a short amount of time. Exercises that help build bone density, muscle strength and improve balance and flexibility not only include those that use just body weight, but also ones that use light free weights, resistance bands or weight machines. As with any other exercise program, be sure to consult your healthcare practitioner before starting an exercise program. They can recommend a program according to your abilities. A properly designed program should help you, not hurt you.